I changed the basket of the child's falling bicycle. Just replace the basket and it looks like a new bike. I would recommend it for cheap. This review is about item#1214894. Although I bought it, I bought it because there is no basket on my bicycle. It was not too big, not too small, just looking for the size to enter the helmet was perfect. Although it is solidly made than you expected, it may be somewhat heavy, so depending on the installation position it may affect the operation of the child's bicycle steering wheel (It is an impression attached to a bicycle which originally has no basket.) I think that I do not mind if it is an exchange. Cycle base Asahi bicycle purchased for the first child Purchased as maintenance for the purpose of keeping on the second person I replaced it. 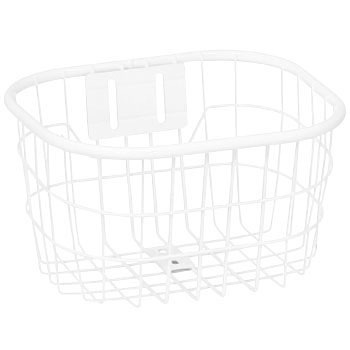 Baby bicycle basket is cheap so far Thank you for handling. Boy seems to be the weakest I thought that I changed my basket to the minimum Very well. Asahiki's bicycle has a solid body It became a feeling that I could still use it with this maintenance. Driver, wrench is necessary for installation. I'm glad I bought it for the time being. This review is about item#1214937. I put it on an 18 inch car. It seems there is more weight than originally attached, and the handle turns freely if you keep it stand upright. It is not enough that the bicycle will collapse. Fitting is good. This review is about item#1214928. It is the best size for children. The attachment part on the handle strut side seems to be insufficient in strength, but it crashed in 3 days after it was attached, although it fell down or collided and did not do anything. It looks like a little small but it is something quite good if it looks pricey. There is "for infants", but a small rear carrier is required, and it is used in combination with a cantical base front carrier. Since the mounting hole of the carrier did not match the mounting hole of this product, it was fixed with a suitable metal fitting. Although the finish of painting and welding also has a dirty part, there is no problem in particular for use, and about 1000 yen is enough quality. This review is about item#01214937.